UNITED NATIONS, Sep 2 2013 (IPS) - When the General Assembly declared 2013 the International Year of Water Cooperation (IYWC) three years ago, the U.N.’s highest policy-making body was conscious of the perennial conflicts triggered by competition over one of the world’s most critical finite resources. Current and past water conflicts and marine disputes have included confrontations between Israel and Jordan, India and Pakistan, Egypt and Ethiopia, Palestine and Israel, and Bolivia, Peru and Chile. The 23rd annual meeting in the Swedish capital, attended by over 2,500 delegates, is due to conclude Friday. Striking a more optimistic note, SIWI’s Executive Director Torgny Holmgren told IPS historically, water has been a source of cooperation more often than not. Over the past 50 years, he noted, there has been almost 2,000 interactions on transboundary basins of which only seven have involved violence and 70 percent have been cooperative. “I think the future situation depends very much on our ability to deal with the water demand challenge,” said Holmgren, a former ambassador and head of the Department for Development Policy at the Swedish Ministry for Foreign Affairs. Irina Bokova, director-general of the Paris-based U.N. Educational, Scientific and Cultural Organisation (UNESCO), the lead U.N. agency which will oversee IWYC, points out that there are numerous examples in which transboundary waters have proved to be a source of cooperation rather than conflict. Nearly 450 agreements on international waters were signed between 1820 and 2007. And over 90 international water agreements were drawn up to help manage shared water basins on the African continent, she said in an interview with IPS last March. According to the London-based WaterAid, nearly 768 million people in the world live without safe water, roughly one in eight people. Some 2.5 billion others live without access to sanitation, about 39 percent of the world’s population. The U.S. intelligence community has already portrayed a grim scenario for the foreseeable future: ethnic conflicts, regional tensions, political instability and even mass killings. During the next 10 years, “many countries important to the United States will almost certainly experience water problems – shortages, poor water quality, or floods – that will contribute to the risk of instability and state failure, and increased regional tensions,” stated a National Intelligence Estimate released last year. In a report released Monday, SIWI says in a world where the population is growing fast and the demand for freshwater is growing along with it, “the fact that we all depend on the same finite water resources is becoming impossible to ignore. “Cooperation between sectors is fundamental if we are to successfully share and manage our most precious resource,” the group says. “We need to cooperate with actors outside the water sector, to foster collaboration between the various decision-making institutions, between the private, public and civic sectors as well as between actors who work in research, policy and practice,” it says. “Only through sound and forward-looking partnerships can we achieve a water wise world,” Holmgren noted. The 2015 deadline for the U.N. Millennium Development Goals (MDGs) is rapidly approaching. And there is good news in some areas, he said. Since the adoption of the MDGs in the year 2000, global poverty rates have been reduced by half. Two hundred million slum dwellers live better lives. School enrolment rates have increased dramatically. “And last year we were able to announce that the world had reached the target for access to improved sources of water,” Eliasson said. But water quality to a large degree still fails to meet basic World Health Organization (WHO) standards, he cautioned. 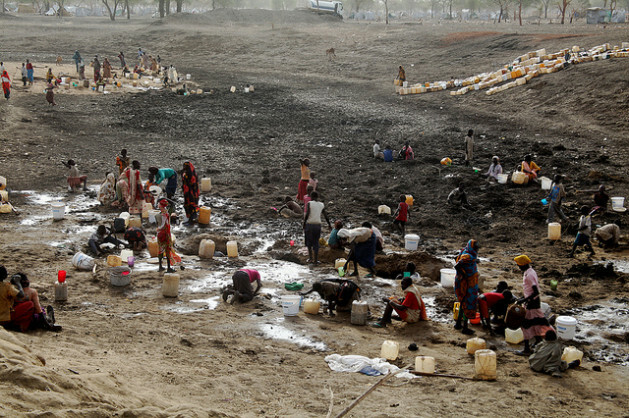 One of the main factors that negatively affects water quality is the lack of sanitation. The sanitation target is among the most lagging of the MDG Goals, with more than 2.5 billion people around the world without adequate sanitation – more than one-third of humanity, said Eliasson. In addition, he said, the intimate connections between water, food, energy, security, biodiversity, and other issues must be spelled out, either in the water goal or in other goals. I have the answers WILL!!!! hey everybody its Bilbo Bagins i mean Gamby02 i mean Steven Hawking i mean Ya mum!!! !